The Chairman, Peoples Redemption Party (PRP) in Lagos, Alhaji Moshood Bankole Mustapha, has described National Leader of All Progressives Congress (APC), Asiwaju Bola Tinubu as the greatest politician to come out of Yoruba land after late sage, Chief Obafemi Awolowo. Mustapha made this known in an interview published by The Sun on Tuesday. 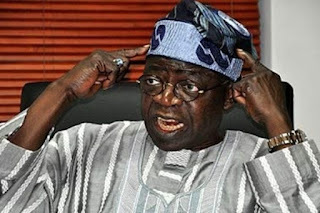 According to him, “Tinubu is no doubt one of the greatest politicians of our time. If you call him Awolowo of our time, it won’t be exaggeration. “From the days of Alliance for Democracy (AD) to ACN and APC, Tinubu has been able to play rugged politics that put the South West at the center. Mustapha, whose party backed the gubernatorial ambition of governor-elect Babajide Sanwo-Olu, urged him to give appointments across party lines for the development of the state. He said, “In the just concluded elections, we joined other political parties’ coalition to support the in-coming governor, Babajide Sanwo-Olu. Now that he has won, our party is ready to work with the governor -elect to promote good governance in the state. “My advice to the in-coming governor is to be father to all in the state. He should carry everybody along by giving appointments across party lines. “Also the governor -elect should aggressively tackle infrastructure decay in the state by embarking on massive road construction.